If you will take your truck off-road, or if you have a truck designed for heavy work, you may need to invest in a lift kit. Lift kits raise the body of the truck to give more room for larger wheels and tires, improve performance in rugged situations and raise the suspension of the vehicle to give it a higher clearance. 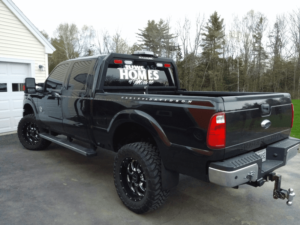 If you are considering buying a lift kit for your truck, here are some thoughts to keep in mind. In order to buy the right lift kit for your needs, you need to understand the three different types: suspension lift kits, leveling lift kits and body lift kits. Suspension lift kits raise the suspension of the vehicle to give it more clearance. They work by taking the front and rear leaf springs and replacing them to give between four and six inches of lift. Suspension lift kits can also improve the handling of the truck compared to other lift kit options. These are the most complex of the lift kits available, and typically include brake line brackets, differential drop brackets, sway-bar drop brackets, a lower skid plate, CV spacers, crossmembers, upper strut spacers and lifted knuckles. Leveling lift kits compensate for the manufacturer’s design that places the rear suspension a few inches higher than the front. Leveling lift kits are not designed to create a visible lift to the vehicle, but rather to create a level vehicle. These are usually an inexpensive option made with lower strut mount extensions. Finally, body lift kits provide a one- to three-inch lift of the body from the chassis. Most truck owners will chose this type of lift kit if they want to install larger tires, because it raises the wheel well. This type of lift kit provides a little additional ground clearance, but the main goal is to create the larger wheel well. Body lift kits come with body spacers and they may have front and rear bumper brackets. They also include a ground strap bracket. Lift kits are designed for compatibility with specific vehicles. As you shop, be certain the lift kits you are considering are compatible with your vehicle. Budget needs to be an important factor when choosing a lift kit. The higher you lift your truck, the more the lift kit will cost. Also, a high lift will require larger tires and wheels, stabilizers and new drive shafts. Some lift kits require professional installation. All of this adds to the cost of the kit. Before purchasing a lift kit, be certain you have thought of the costs of all of the additional items you will need. Installing a lift kit changes the physics of your truck significantly. Trucks are designed to have a low center of gravity to ensure they are balanced and do not flip when they turn. Even just a few inches of lift will change that center of gravity, putting the vehicle at risk for rolling over. If you are adding more than four inches of height, you will need a stabilizer to ensure that the vehicle is stable on turns. If the lift kit does not include a stabilizer, you will need to invest in one in addition to the lift kit itself. Similarly, when you alter the suspension and tire height, you also change the shock absorbing system. Sometimes the ride becomes less comfortable as a result. You may need a new shock absorber, so consider looking for a kit that has one. A lift kit can benefit your vehicle, but if your vehicle has a warranty, installing one could potentially void the warranty. Before you install one, check the vehicle warranty, and decide if you are willing to risk voiding the warranty for the benefits of a lift kit. Lift kits can give your truck a new look, help improve its performance and give it more clearance. With higher riding wheels, larger tires can be used to improve off-road performance. If you decide to install a lift kit on your truck, take the time to do your homework, so you can be certain the kit you buy is compatible and appropriate for your particular truck.